I’m no Martha Stewart. In fact, my interior decorating skills are virtually nonexistent. I don’t have a knack for it. I don’t enjoy it. And, honestly, I don’t care too much about it. But, I love decorating for Christmas. I don’t go all-out crazy, but putting up a Christmas tree brings me joy. I love going through ornaments and reminiscing. My Christmas tree tells a story. The tree itself doesn’t say too much. It’s an artificial tree. That’s what works best for our family. This year that artificial tree also says the cold weather in our shed has wreaked havoc with its fiber optic lights, so they are not lighting up, but that’s just a very small underlying plot in the story of my Christmas tree. The lights that adorn it are multi-colored, which are my favorite. They are set to “twinkle” so that they move and sparkle. Those lights come on first thing in the morning and go off last thing in the evening. Nothing is sadder to me than a dark Christmas tree. The lights are the backdrop for the real story. The ornaments tell the story of my Christmas tree and of my life in some ways. I have an ornament that looks like a stuffed teddy bear wearing a red dress. I don’t know when I got it, but I was a child. The teddy bear looks so much like my beloved childhood teddy bear, Kacey. When I hang her on the tree each year, I can’t help but smile at the memories. And yet she brings new memories as well. My daughter is very into teddy bears right now. She spotted the bear ornament right away and said “bear” over and over pointing at it. In the end, I had to move it a bit higher out of reach of the little one. I’m not sure how securely those beady eyes are still fastened on! 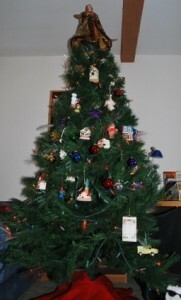 Our Christmas tree may not be the most glamorous or put-together tree, but it tells our story. I wouldn't have it any other way! Then there is a plastic ornament with the music and lyrics to “Joy to the World” printed on it. My daughter also has a fascination for this one. I loved it as a child. I remember one Christmas we had visitors from our church. I don’t even remember who, but I pulled the ornament off the tree and sang for them. Of course, it didn’t matter that I was holding it upside down at the time. Egads! But, that memory makes me smile. Then there is the ornament from Pikes Peak in Colorado where I went on vacation after my freshman year of college with my parents. And another ornament from Alaska that my parents got for me when they went there a few years later. From 1999, the year I got married, I have a couple of first Christmas ornaments. One has a photo of my husband and me in it. It’s from our honeymoon. As we hung it this year, we looked at the photo and smiled. “Look at those kids,” my husband said. We showed our daughter. She wasn’t impressed, but it brought back a slew of memories for us. There are also clear plastic ball ornaments from 1999 that we decorated with glitter glue and tissue paper. Some of them are falling apart, but I always put at least a couple on the tree to remind me of that first Christmas together in our tiny college apartment. We had a small tree and a small budget, but we had a great time. There’s a Schwan’s truck ornament I got a couple of years ago when I finally found and ordered the pizza cutter my husband had long been wanting. And there’s an ornament with a dog on it, personalized to our dog, Buckles, from 2005 — his first Christmas. Now there is also a pink ornament with “Lexiana” written on it from last year. This year, we’ll add another ornament to the tree for her. I plan to do that yearly so that when she grows up, she will be able to have her own Christmas tree that tells a story. She will pull ornaments out from their tissue, pause to smile at a memory and then place it on her tree. That’s my hope at least. What story does your Christmas tree tell?